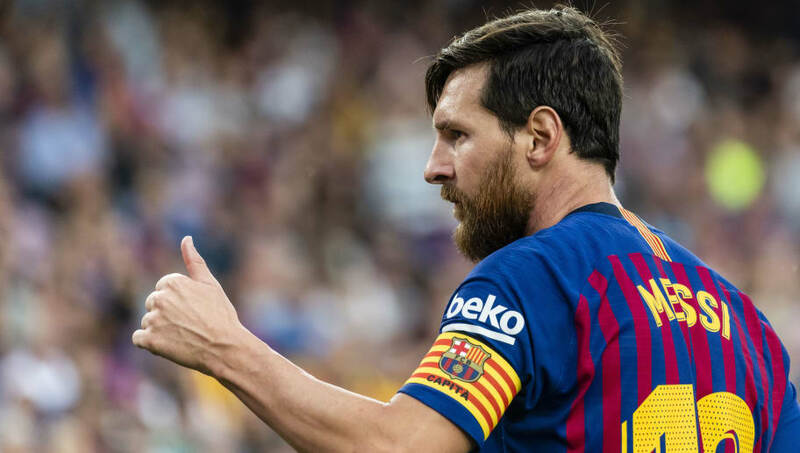 If past results are anything to go by then ​Barcelona can expect a tricky tie when they travel to San Sebastien on Saturday to face a plucky Real Sociedad side that have won, drawn and lost in their opening three games of the season. The Catalans have won only once at the Anoeta Stadium in the league since 2010, making Asier Garitano's side somewhat of a bogey team for ​Messi and co. Nevertheless, three wins in three mean Barça are currently sitting top of the table and go into the match having conceded just two goals in comparison to Sociedad's five. ​Barça will be desperate to end their spell of draws and defeats away to the Basque side as they look to keep the pace with rivals ​Real Madrid, who sit in second place also on nine points. Sociedad, meanwhile, will jump at the chance to move off the four points shared by ten other teams in the league, as they look to qualify for Europe this season. Here's everything you need to know ahead of the match. With the Txuri-urdinak such a perpetual thorn in Barcelona's side there are a handful of matches to pick from in which the Catalans have become unstuck. However, none quite compares to their defeat to La Real in the same season that saw them sweep aside Alex Ferguson's Manchester United in the Champions League Final. With Pep Guardiola at the helm and the likes of Messi, Xavi, Andres Iniesta and Gerard Pique in their prime, losing to the newly promoted side appeared inconceivable. Yet despite an early goal from Barça midfielder Thiago, Sociedad netted two goals within ten minutes, including a penalty winner from local hero Xabi Prieto, to turn the match in their favour and make up for the demoralising 5-0 defeat suffered at the hands of Guardiola's side just a few months previous. Coutinho may not have appeared on the scoresheet in Barça's ​8-2 thrashing of SD Huesa last match, however he is increasingly showing his potential as Iniesta's successor in the creative sense and is a dangerous presence when on the ball. Illarramendi, who is known for his tireless defensive work, will have a difficult job on his hands in containing the Brazilian, yet he will have to find a way if Sociedad are to keep Barça from playing their game. Coutinho showed himself to be one of Brazil's most important players at the World Cup this summer and he'll want to carry forward that momentum in what will be his first full season for the Blaugrana. With Iniesta now playing football in Japan, the stage is set for the 26-year old to live up to his €120m transfer fee. Illarramendi, meanwhile, may have viewed his return to San Sebastien from Real Madrid as a step backwards, yet he can still play an important role in helping La Real push for a European spot, starting with a result against the Catalan giants. As captain, he'll be the man to give his side the extra gusto they'll need to continue imposing the 'curse of Anoeta'. Real Sociedad will miss the services of Willian Jose, who has scored two in three so far this season, while Adnan Januzaj is struggling with a knee problem. On-loan Everton forward Sandro Ramirez will also be absent for the hosts after suffering a knee ligament injury during training, as will Jon Guridi and Diego Llorente. Ernesto Valverde is without any major injury setbacks, while new signings Arturo Vidal and Arthur are yet to tie down a spot in Barça's starting XI, meaning it is likely that the midfield trio of Rakitic, Busquets and Coutinho will remain. Real Sociedad (4-2-2): Rulli; Zaldua, Elustondo, Moreno, Theo; Sangalli, Illarramendi, Zubeldia, Zurutuza; Oyarzabal; Juanmi. FC Barcelona (4-3-3): Ter Stegen; Roberto, Umtiti, Pique, Alba; Busquets, Coutinho, Rakitic; Messi, Suarez, Dembele. Despite Real Sociedad's 2-1 away loss to SD Eibar before the international break, they've got off to a fairly strong start in a season full of expectation for Asier Garitano's side. They will be well aware of how dangerous Barça can be when they get into full swing, with the 8-2 win over Huesca still fresh in everybody's minds, however past results between the two suggest this will be anything but a walk in the park for the Catalan side. Nevertheless, with La Real's top scorer out with injury, the Azulgranes will be keen to pick up from where they left off last season by making it three wins in a row and, based on their form in the opening three games, they go into the match as heavy favourites.